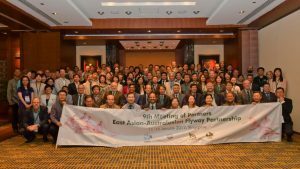 Our amazing Eduardo Gallo-Cajiao, Micha Jackson and Stephanie Avery-Gomm visited Singapore in January 2017 to attend two major international meetings targeted at designing actions to save our flyway’s incredible migratory waterbirds. Fuller Lab PhD candidates Ed Gallo-Cajiao, Micha Jackson, and Stephanie Avery-Gomm in Singapore. 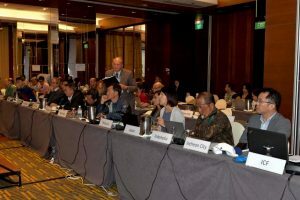 The first was a 2-day meeting to discuss the AMBI, which is an initiative of the Conservation of Arctic Flora and Fauna biodiversity working group of the Arctic Council – to which Singapore is an observer. 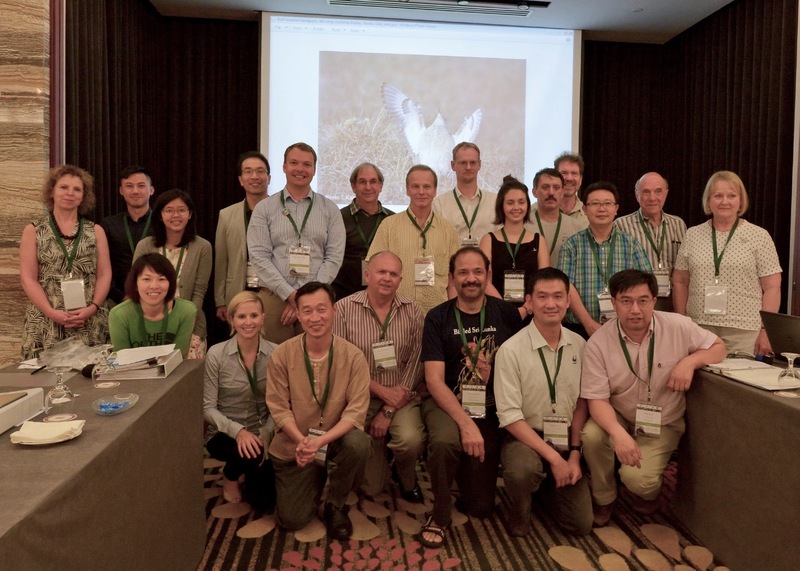 This meeting was attended by PhD candidate Ed Gallo-Cajiao on January 8th and 9th and held at Sungei Buloh Wetland Reserve, a site recognised internationally for its importance to migratory waterbirds. The inspiring meeting location offered delegates the opportunity of enjoying some fine birding during coffee breaks. One of AMBI’s key aims is to improve the sustainability of biodiversity use in the Arctic, but doing so requires strong cooperation from flyway range countries outside the Arctic, as many waterbirds breed in the Arctic but migrate south. A series of presentations from Alaska to Indonesia showcased how many thousands of migratory waterbirds are hunted along this flyway by multiple human groups, and how overuse is likely in the absence of overarching coordination. After intense deliberation by representatives from multiple sectors, a recommendation was made to establish a working group on this issue with support from the Convention on Migratory Species. The Sungei Buloh Wetland Reserve has been designated a Flyway Site Network under the East Asian Australasian Flyway Partnership. 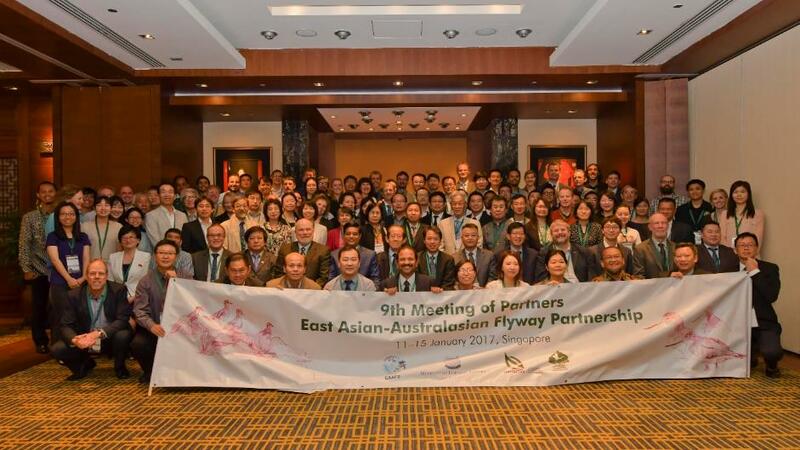 The EAAFP is multi-actor voluntary agreement for conserving migratory waterbirds along the 22 countries of the East Asian-Australasian Flyway. 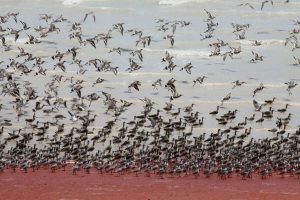 It has a primary focus on habitat conservation for shorebirds, cranes, anatidae, and seabirds – as habitat loss remains a key threat to many species across these taxa. The EAAFP Meeting of Partners (MOP) is convened every two years and is the main decision-making forum of this agreement. On January 10th, several targeted pre-meetings were held prior to the commencement of the 9th Meeting of Partners of the EAAFP. PhD candidate Stephanie Avery-Gomm was invited to join the EAAFP Seabird Working Group. The paucity of standardised monitoring data on the flyway’s 118 breeding seabirds was raised, and this became a recurring concern identified throughout the MOP for all species groups. 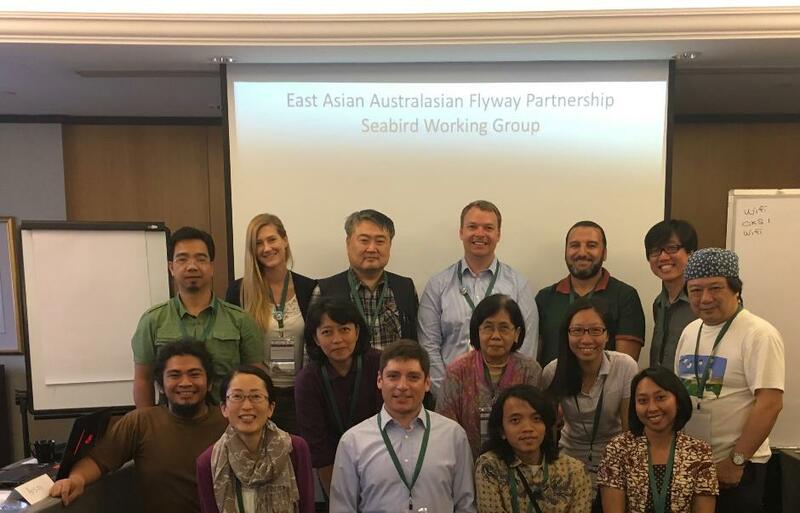 Among other commitments, the Seabird Working Group pledged to carry out a flyway-wide analysis of population trends and knowledge gaps. This work will be carried out by Stephanie, as it dovetails with her current PhD analysis of global seabird population trends. The group also shared and discussed the remarkable story of the Chinese Crested Tern, thought to be extinct for over 60 years before its rediscovery in 2000. 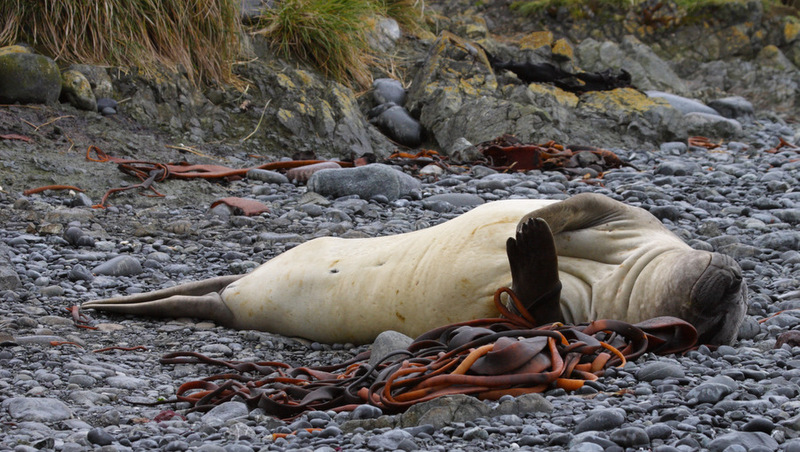 This positive story, amidst a backdrop of continuing declines in many other species, served as a beacon of hope showcasing the importance of coordinated, targeted actions. PhD candidate Micha Jackson attended a joint pre-meeting of the Shorebird Working Group and Far Eastern Curlew Task Force. She delivered a background presentation summarising the Far Eastern Curlew’s status, trends and threats, prepared in consultation with researchers during the months leading up to the meeting. 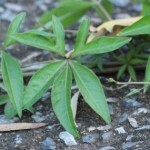 Discussions were held around a proposed Single Species Action Plan for the species, later approved by the EAAFP Partners at the Meeting of Partners, which the Task Force’s workplan for the next 2 years is aimed at implementing. 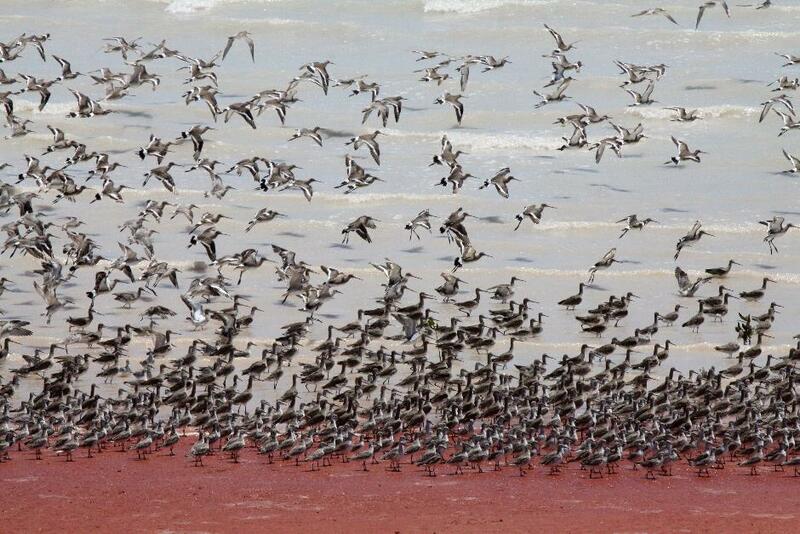 One action item proposed for the Shorebird Working Group was the collation of information on best practices for managing Working Coastal Wetlands; these manmade habitats, heavily utilised by waterbirds throughout the flyway, are the focus of Micha’s PhD research. 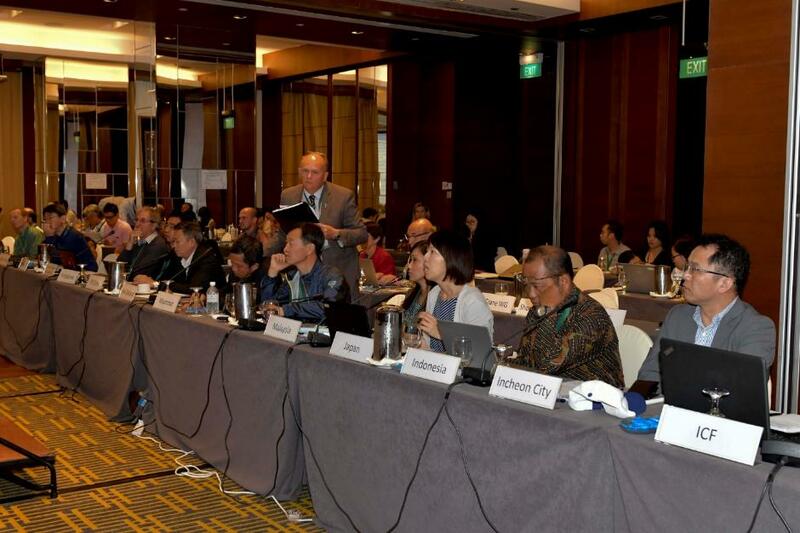 The Meeting of Partners proper was held for the subsequent 5 days from January 11-15 January. Membership to the EAAFP has grown since the last MOP with the addition of the Hanns Seidel Foundation. 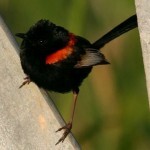 The EAAFP’s Flyway Site Network also expanded with the addition of 13 new sites in 6 countries in the last two years. Partners were encouraged to continue nominating sites, but it was stressed that mechanisms for regularly monitoring and reporting on their status and responding to threats is still lacking, with basic information lacking even to the Secretariat of the EAAFP on many of these sites. A clear focus of the meeting was the strengthening of the governance arrangements that support it. A new Technical Committee was established to provide scientific and technical advice to the Secretariat, Partners, Working Groups, and Task Forces, which should increase the Partnership’s formal engagement with researchers. New Rules of Procedure were approved for the proceedings of the MOPs, which will increase formality of future meetings. 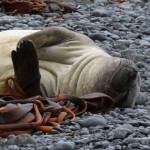 A 10 year Strategic Plan is scheduled to be developed, bringing the partnership in line with the workings of other Multilateral Environmental Agreements, such as the Convention on Biological Diversity. Diversifying fundraising efforts was also a key focus; building on the previous MOP, a fee-based voluntary contribution system by partners was adopted to diversify the funding base. However, implementation may be challenging, as several government Partners do not yet have mechanisms in place to make optional payments to non-legally binding agreements (legally binding agreements often have compulsory contributions based on a UN system). Ongoing habitat loss, hunting, and lack of coordinated monitoring effort were some of the key conservation and management topics addressed by Partners at the meeting. The profile and awareness of habitat loss seem to be increasing with several media campaigns and programs having occurred in flyway countries since the last Meeting of Partners. On this front, the intention of the Republic of Korea to submit a significant amount of its remaining tidal flats for UN World Heritage Listing is a promising sign, as is the development of the Southeast Asian network for wetland conservation under ASEAN. A Single Species Action Plan for Scaly-sided Merganser was approved alongside the one for Far Eastern Curlew, with both listing hunting as one key threat to the species. 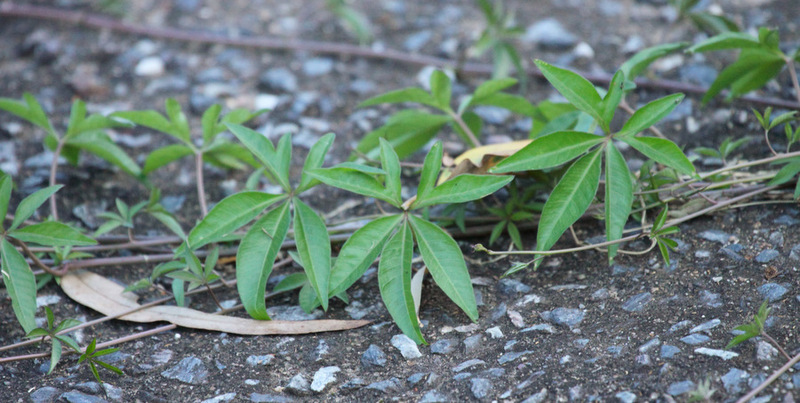 Building on the AMBI meeting recommendation, an interim Task Force on Illegal Hunting and Unsustainable Harvest was established under the EAAFP. Echoing discussions at the Seabird and other Working Groups, a Task Force focused on species monitoring reiterated a goal of previous meetings to develop a cooperative framework to better coordinate monitoring throughout the flyway. 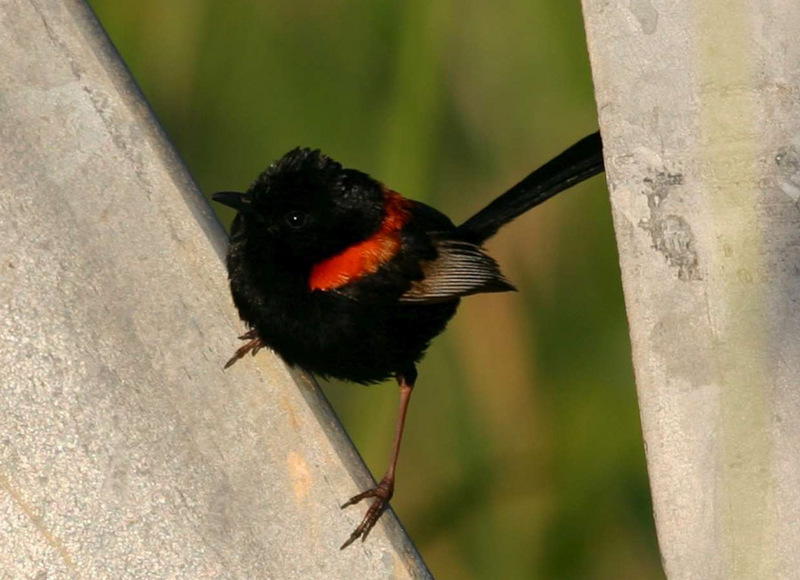 On the third day of the meeting, participants were able to get outside the rooms and into some of the beautiful habitats in Singapore, many of which are used by the very birds they had been discussing. Trips to Sungei Buloh wetlands and Pulau Ubin Island included coastal habitats and diverse species lists, while an afternoon at the Gardens by the Bay showcased some of Singapore’s unique attractions and architecture. Key birds of the day included Whimbrel, Oriental Pied Hornbill, and Mangrove Pitta. The outing re-energised discussions that rounded out the meeting when delegates reconvened for the final two days. 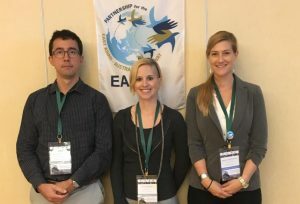 On the whole, both meetings were well attended by Partners and external observers, and the good engagement of delegates in formal and interactive sessions seemed to signal a growing regional commitment to positive change while underscoring the ongoing state of crisis facing many of the region’s waterbirds. 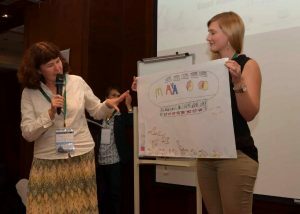 Diana Solovyeva (left), coordinator of the Scaly-sided Merganser Task Force, participating with Stephanie Avery-Gomm (right), UQ PhD candidate, in one of the MOP’s interactive sessions.